We finally managed to get our fooding back on track, after a few months-long hiatus. We started out close to home with the Rosedale Diner, which was actually further than we had thought it would be. 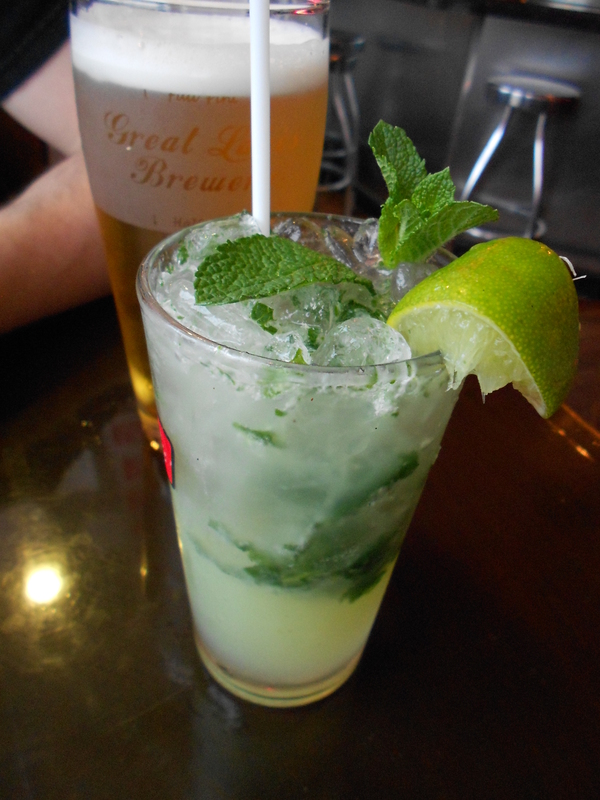 Brent had mentioned that they were known for their mojito. I balked at the idea of a drink with mint in it, gross, I said. But something about it intrigued me and I found myself ordering one. And it is a good thing I did, the mojito was amazing! Except now it has set a rather high standard that I am sure will result in many disappointing mojitos to come in the future. On the plus side, when I go to the Kentucky Derby, I no longer risk not fitting in. To start we split a side of hummus with pita bread. 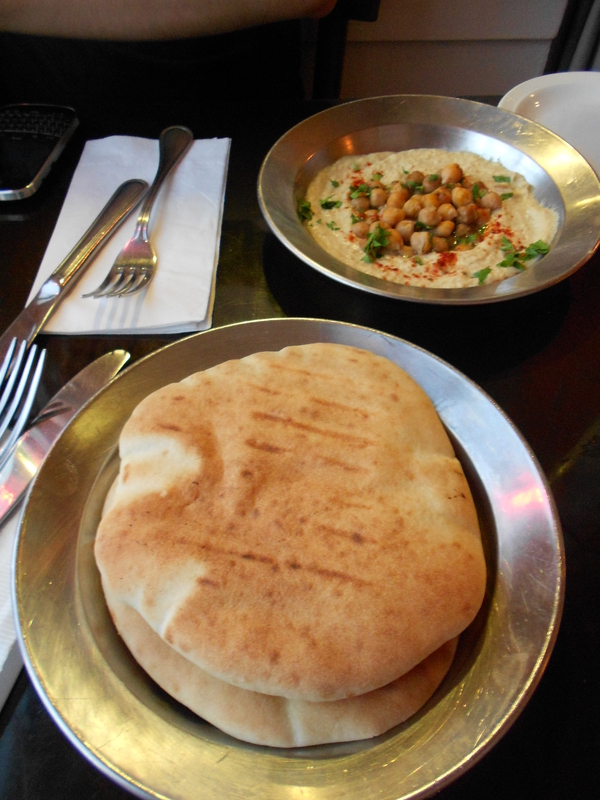 The hummus arrived on a warmed plate, with chickpeas on top. It was amazing, easily a tie for the best hummus I have ever had. And so fun to eat! I did not even dig around the chickpeas, I happily ate them. For our mains we both got duck dishes, because it would not make sense for us to both get dishes with fries, apparently. 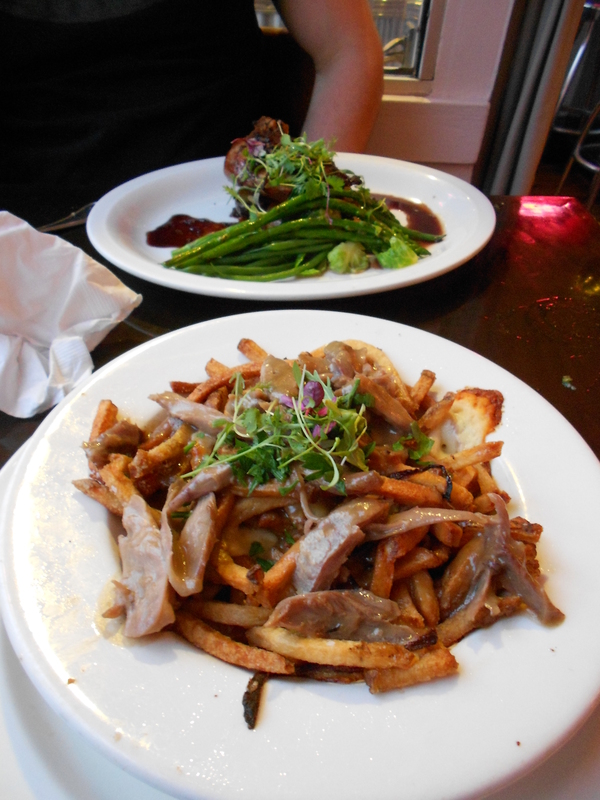 I was torn between the duck confit poutine and the steak frites. I made the right choice with the duck. It was amazing! Usually poutine is greasy and heavy, but this one somehow managed not to be. The fries remained crispy even. Brent won however with the duck confit leg. He doesn’t even like duck, and he loved it. We had wanted to sit on the patio, as it was voted one of the best. Alas it was raining and we had to sit indoors. That just means more mojitos and an order of steak frites in the future. My cookie cravings got the best of me and I found myself in the kitchen mixing up a batch of smores pudding cookies, THE perfect fix for a cookie craving. They’ve got everything: pudding, marshmallows, chocolate chips. And for once I had everything. This was one of those rare kitchen escapades wherein I had all the necessary ingredients and appliances and it shows. The dough was delicious, I had to hide it in the fridge not just because I am actually making the cookies for the weekend (it is Wednesday right now) but also to stop myself from eating it!! 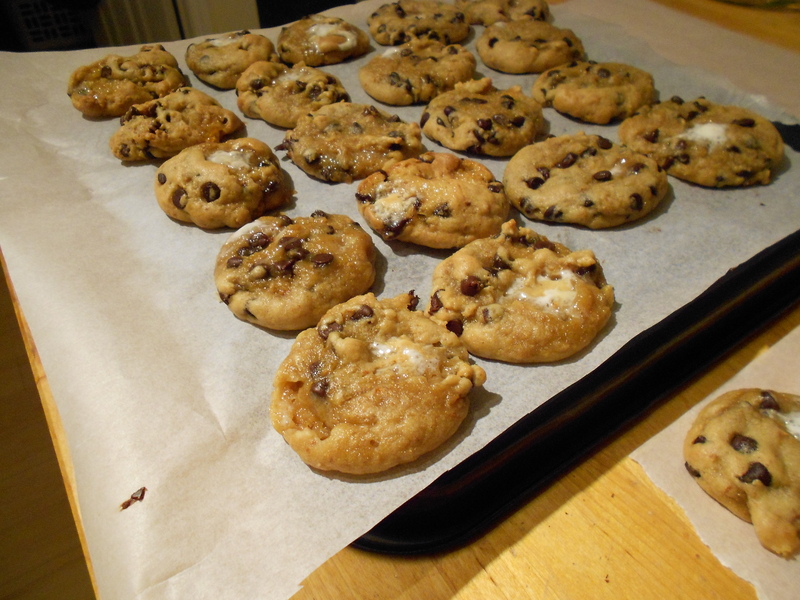 I even ended up baking a few just to “test” them and make sure they were in fact as delicious as the dough. They passed with flying colours, though I am unsure of how much dough will be left by Friday, when I actually intend on baking them. As it turns out, I should be just as worried about how many cookies will last until Saturday. They are so delicious and soft and I cannot help myself. I keep eating the “ugly” misshapen ones because, who wants to serve ugly cookies anyways? Really I am doing everyone a favour… unless I eat them all, of which there is a high probability happening. Update: that cookie right there in the foreground? Bottom of the image? It’s gone. I ate it. There is nothing in the world I hate more than math, except maybe broccoli. 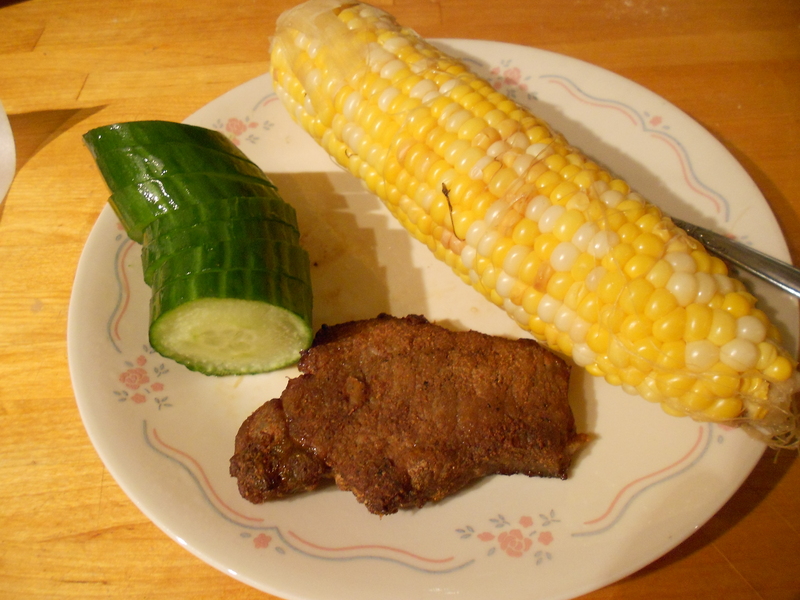 For the most part the math on recipes is simple, simply halving all the measurements, there is the occasional half of 1 1/2 but even then things turn out fine.The recipe for Spice Rubbed Pork Chops (sans zuchinni though) proved to be a doozy. I had initially just glanced over it and took note: 4 pork loin chops, easy enough to remember right? Having learned in the past to pay close attention to the weight of meat required I double-checked that and good thing I did: turns out I had purchased tiny little pork chops and if I were to follow the recipe I had to cut everything by 1/3. This was only further complicated by the fact that I really only wanted to make 2 pork chops, and save the other 2 for another recipe that has caught my eye. I had to divide the whole recipe by 1/6… to make matters worse, Google sometimes gave me measurements in milliliters and I would then have to convert that to teaspoons (well, fractions of teaspoons). All in all, the math took longer than the prep. The recipe is simple, albeit a little more hands on than I had expected. Cutting the fat off the pork was also not fun, the fat was slick and hard to grip and I was certain I would end up with a knife wound. After some struggle I managed to cut off a good deal of it, which is to say not that much at all, my pork chops were lean it seems. It could have been my measurements, but the rub was more of a paste (not enough oil maybe) and I ended up having to get in there and just rub it right into the pork rather than shaking it about in a container. Every once in a while I get a little creative in the kitchen… and it only sometimes ends in disaster. This was not one of those times. My aforementioned turkey meatballs needed an accoutrement for dinner, something other than the usual noodles (which I am somehow still not sick of). 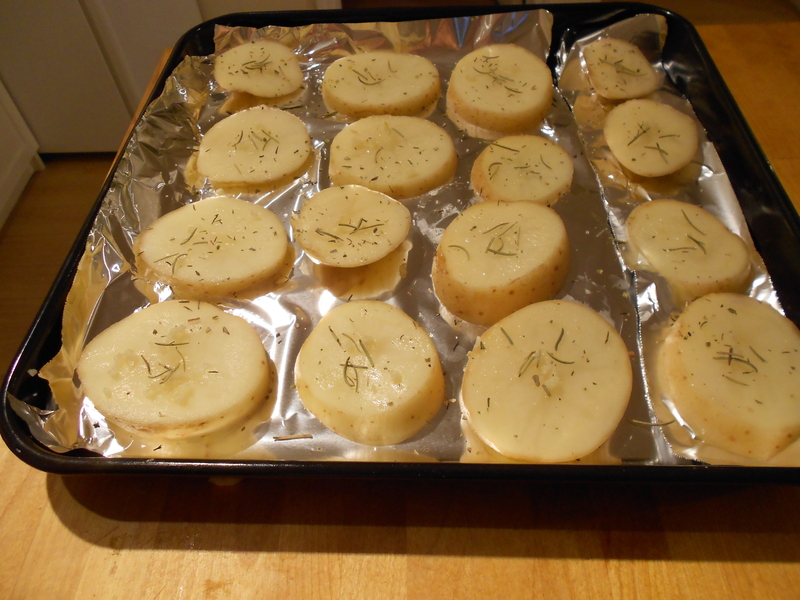 Slice up the potato(es) into rounds and lay them out on a lightly greased baking sheet*. 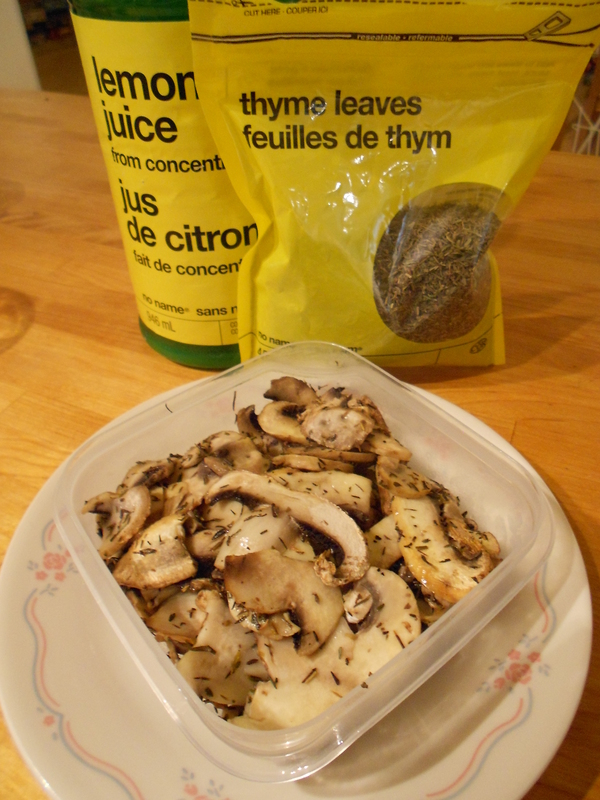 Sprinkle each slice with a small dash of salt, rosemary, thyme and oregano. Bake them in the oven at 400F about 15-20 minutes, take them out and turn them. Repeat the above. 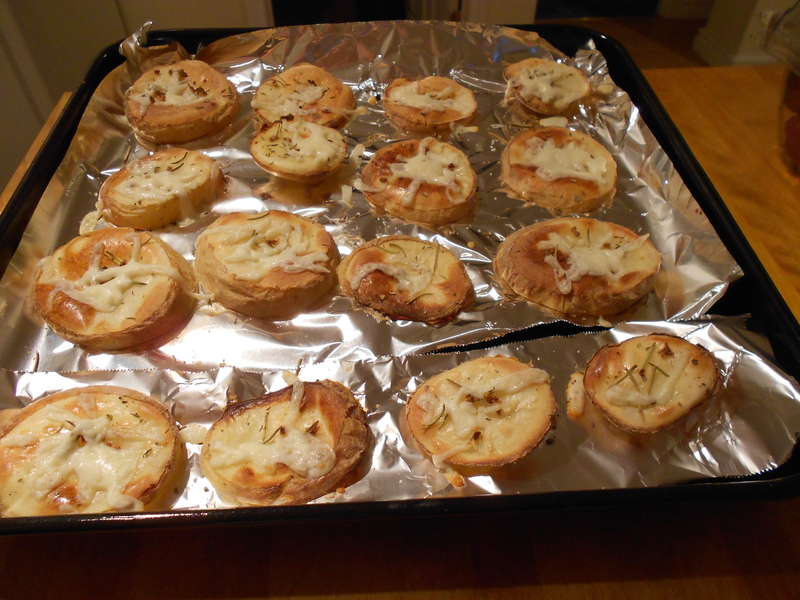 Sprinkle them with cheese and leave them in the oven, turned off, for about a minute just until the cheese melts. * I learned this the hard way trying to loosen the slices from the pan, messy but not tragic. 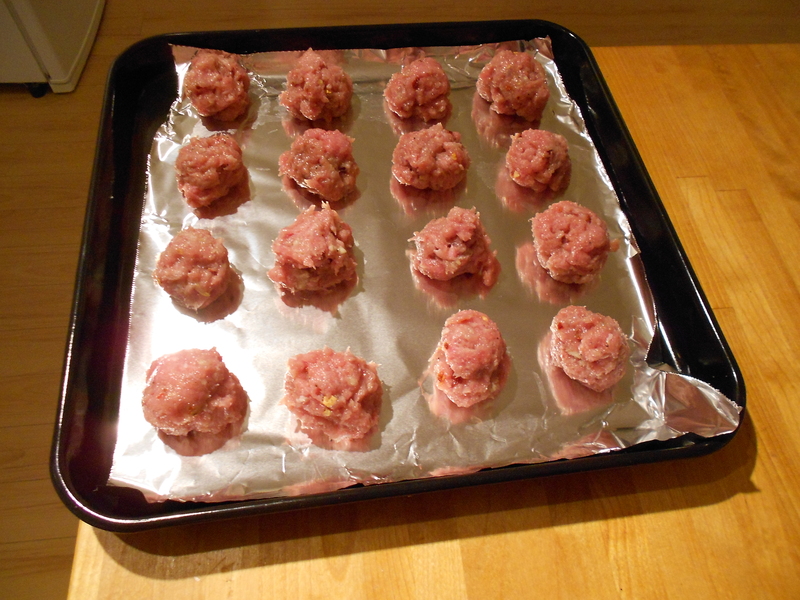 Turkey meatballs sound so healthy… until you read the recipe and it calls for frying them. 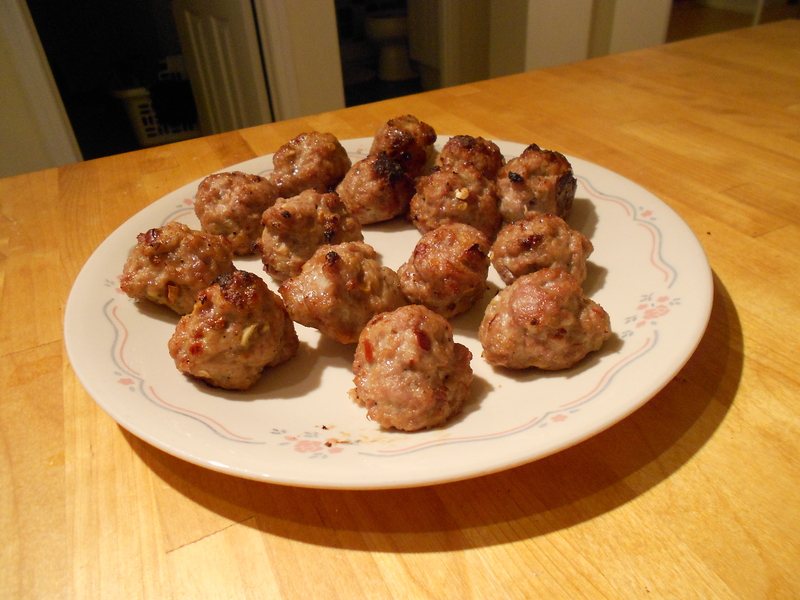 I could not resist the idea of honey-chipotle turkey meatballs, it just sounded so delicious! Plus I was stocking up from No Frills (because it is closing down) and so I bring you another in the wonderful Cooking For The Apocalypse series: modified honey-chipotle turkey meatballs. I know, modified sounds gross. What I meant was I had tweaked the recipe and not that I was using mutant turkey meat (maybe the reason for the end of the world?). Lacking chipotle, I used crushed red pepper flakes and a dash of paprika- kind of sort of the same thing almost? Also not wanting to fry the meatballs, I just tossed all the ingredients in at once and baked them instead. And you know what? It wasn’t a total tragedy, they turned out delicious despite the oddness of at first bite having the sweetness of the honey followed by a slow spicy kick on the end. I was at my usual No Frills last week and it had looked like the end of the world was coming. I joked about an apocalypse and went on with my day. The next week I found out my joke wasn’t that far off, my No Frills is closing down! My only options will now be super-expensive grocery stores. What else can I do but stock up on as much as I can carry? With that massive stocking up comes massive cooking! Enter a new subseries in my Pinterest-inspired forays into the kitchen: Cooking for the Apocalypse. How fun! 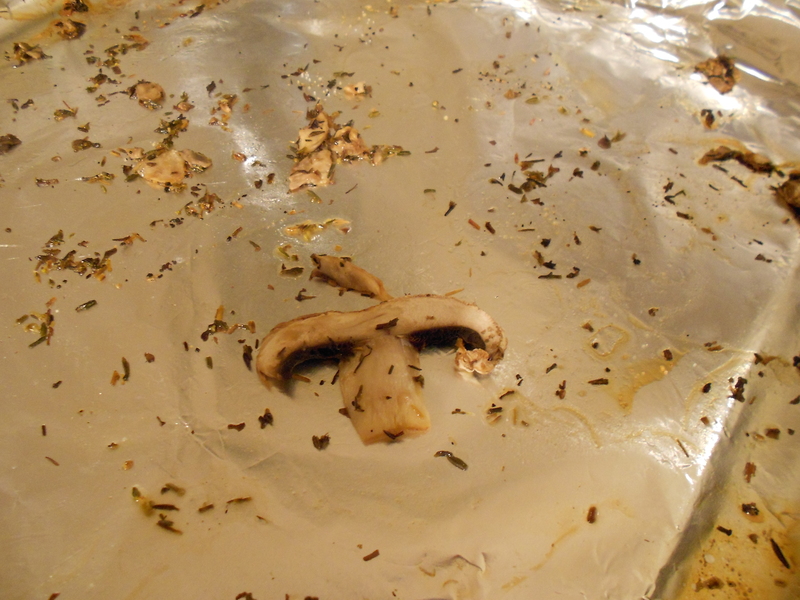 The oil and thyme mixture was much thicker than I had expected, resulting in less of a drizzle and more of a dollop… and concentrated in one spot. I had to get in there and mix up the whole thing by hand, a messy affair to say the least. My hands were covered in bits of thyme, and although they smell delicious- they are still super greasy. 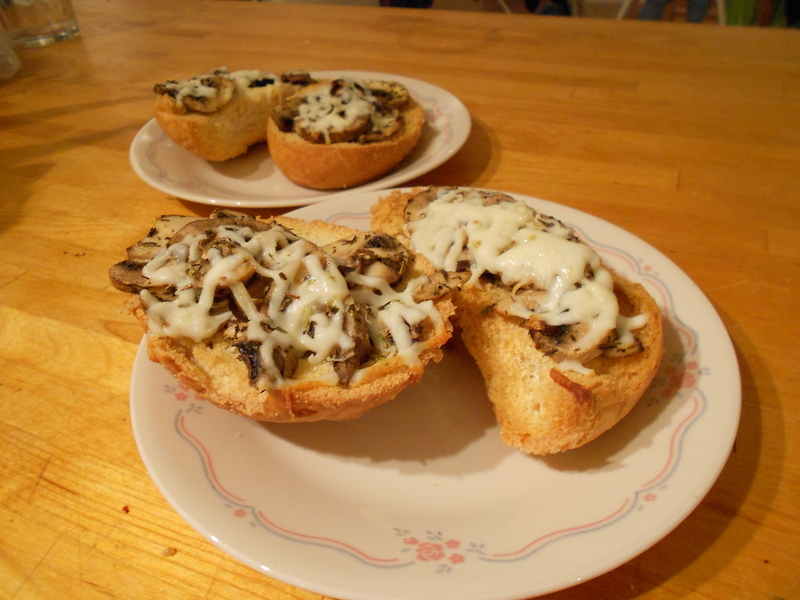 Sprinkle the cheese and then the mushrooms on the baguette, and bake it until the cheese melts and the bread is crispy. Done. Years ago I had tried to make a Jello poke cake but it failed epically. I had disregarded the part of the recipe that said to use a cake mix that was pudding based. I could not find one, and just used a regular mix. The cake just got soaked with the Jello. The pudding was so that the cake would not absorb all the Jello, leaving little bubbles of it throughout. I recently found a box of pudding-based cake mix and I had to buy it. We were going to visit our friends and I thought this would be a great opportunity to make it. It failed miserably. All I know is don’t buy Dr. Oetker cake mixes, bleh. It came out a weird, lumpy sopping mess. It is really difficult to screw up adding JUST WATER AND 1 EGG. I tossed it, but my craving for baking was still nagging at me. I had just bought a whole carton of eggs and I was craving something delicious. 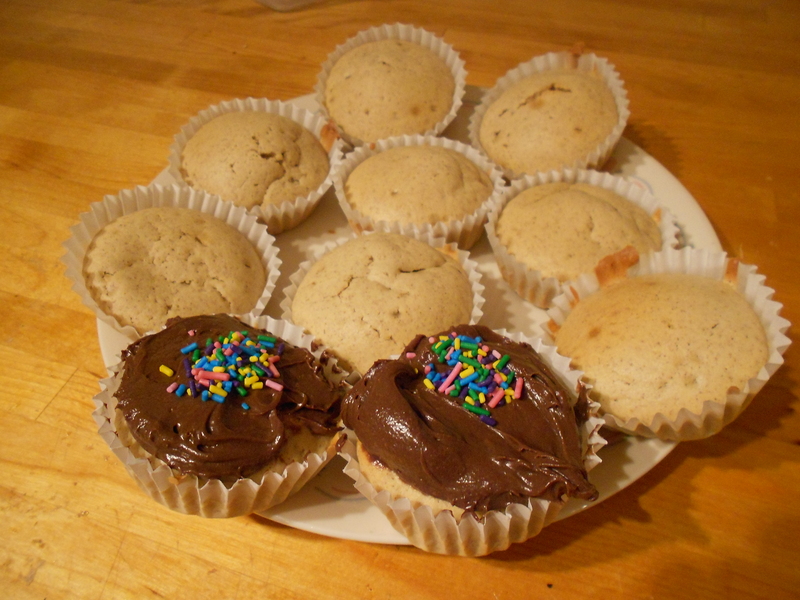 Snickerdoodle cupcakes to the rescue! Only I had enough margarine for a half batch, complicated math ensued such as what is half of 1 3/4 cup? It was bad. I crossed my fingers and hoped for the best. They weren’t terrible, just small and sort of dense. The key thing is: they tasted good. That is all that matters, however these are begging for a re-do, a proper one.